Is it any surprise that there was no way I could resist a name like “The ‘World’s Best’ Veggie burger"? I picked up a pack (2 veggie patties per pack) of Hilary’s Eat Well “World’s Best” veggie burgers at Whole Foods, determined to find out how they stood up to that claim. 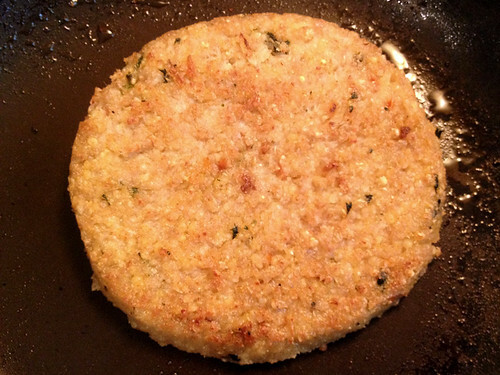 I fried a patty in a bit of olive oil for a few minutes until both sides were slightly browned. 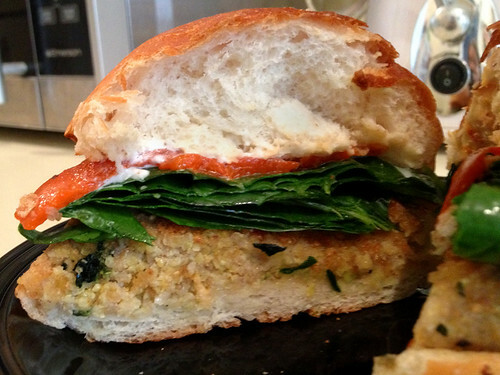 Then I dressed it up with a bit of fresh spinach, roasted red pepper, and mayo. The verdict? This is a nice, light burger. Not too dense or filling, it felt very healthy. 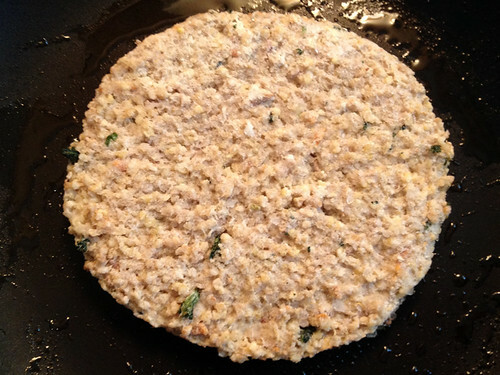 It’s made of soft, fluffy millet and quinoa, but it did crisp up nicely around the edges when fried. It had a subtle but tasty flavor, with bits of greens mixed in with the grains. It’s not a hearty, meaty burger (and I don’t think it would hold together well on a barbecue grill) but I enjoyed it. I think it might actually be better on its own, without a bun – I ate the second one in the package that way, a few days later, and it kind of reminded me of eating a breaded fish fillet (not that my memory of what eating fish was like can really be trusted, after over a decade has passed since I last ate it, and it didn’t taste “fishy” at ALL, but something about the texture just reminded me of that fishstick kind of breading…). Vegan, gluten-free, yeast-free, soy-free, and kosher – this burger is for everyone except people who are allergic to coconut (it doesn’t taste like coconut, don’t worry – coconut is just listed as an allergen warning). 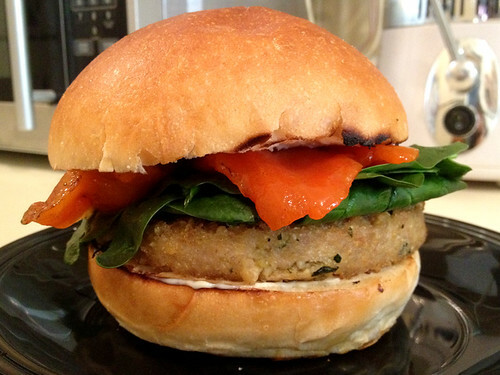 Is it really the “world’s best” veggie burger? Well, no. That’s a bit presumptuous. But it is tasty. 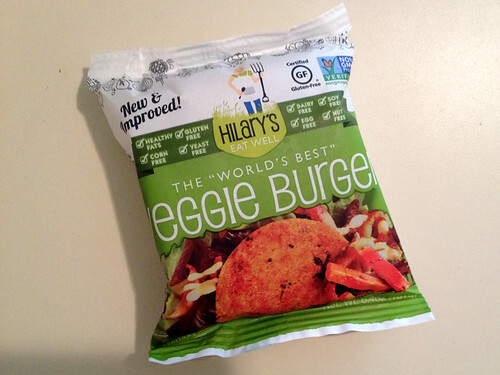 And I’ll probably try some of the other flavors of veggie burger that Hilary’s offers. Looks pretty good. I'll have to look for these.